Devout Catholics would most probably have heard about Simala. 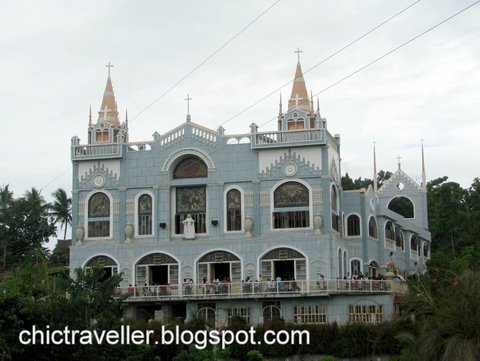 Simala is a church built by monks in Cebu's Southern province of Sibonga. It's about an hour and a half drive from Cebu City, two hours at most. People from all walks of life take time to visit the Simala shrine, even if it's a bit far from the main road. A lot of people go there to offer prayers, since the place has been home to the Blessed Mama Mary who has performed miracles and granted wishes to her devotees. On my first visit to Simala shrine, I was amazed by the multitude of visitors the shrine had at that time. People waited patiently in the hot summer sun, standing in line to go inside the church and have their turn to visit the Marian shrine. We fell in line as well. We sure didn't want to miss the opportunity of seeing the miraculous Mama Mary and offer prayers ourselves. When you go near the shrine, a guard will advise you to take off your shoes as you need to walk barefoot towards the shrine. You can leave your shoes there or you can carry them along with you. For those who are wearing sleveless shirts, the guard will make you wear a sarong to cover yourself up. When I got to the shrine, I smelled a sweet scent of roses that seemed to fill the air. I don't know if this is true for everyone, but I felt at that time a certain level of peace when I was praying in front of the shrine. I really felt that the place was sacred. It's a feeling I entirely cannot explain. On my way out, there were lots of inspiring letters displayed in glass cabinets near the wall. There were letters from nurses and other professionals who passed their board exams, people reunited with their loved ones, and more. It's very touching to read all the letters of prayers granted through their devotion to the Mother Mary of Simala. The place is definitely worth a visit. Each day, the monks work hard to make the place beautiful for their visitors through donations and goodwill. I've visited Simala three times already, and each time I always see an improvement in the place. It won't be long before Simala becomes a big tourist destination in Cebu. Once you get to Sibonga, you have to look out for a small sign pointing the way to Simala. If you get lost, it never hurts to ask people on the road. They'll be glad to point you to the right direction, as Simala is popular around the area. From there, you follow a paved path towards the church. Go to Simala early in the morning to avoid a big crowd. Ideally, you should leave Cebu City at around 7-8am. By the time you get to Simala, you'll get to park comfortably inside the church grounds. Don't wear sleveless shirts or skimpy skirts. The guards will not let you in and will ask you to put something on to cover yourself up. For more Simala photos, check out this blog.